(Nanowerk News) Cells, the basic building blocks of life, are delimited by membranes—the cell’s skin—which act as intelligent barriers that allow the entrance of selected materials and nutrients, while blocking the passage of unwanted chemicals, and unfortunately, also many drugs. Currently, one of the major challenges in biomedical research is the study of these internalization processes, with the aim of enhancing the absorption of drugs and chemicals in a controlled way, in order to heal or repair them. 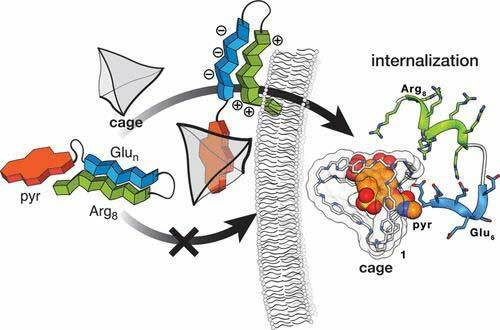 In this context, JACS ("Anion Recognition as a Supramolecular Switch of Cell Internalization") has recently published a contribution developed at CiQUS (Center for Research in Biological Chemistry and Molecular Materials of the University of Santiago de Compostela - USC). In this paper, researchers propose a new molecular strategy that allows the control of the cellular internalization of different synthetic protein fragments. The new molecular systems have a negative charge balance, that is: a greater number of negative than positive charges in their structure, which blocks their passage through the negatively charged cellular membrane. CiQUS scientists have managed to reverse their overall charge balance by wrapping them inside a positively charged cage. This new nanometric cage is thus able to transport these negatively-charged compounds compounds inside the cell. “Imagine a truck with such a tall load that forces the vehicle to stop when it reaches a tunnel”, explains Professor José Luis Mascareñas, ERC Advanced Grant and corresponding author of this work: “This capsule is like a crane that moves that cargo to a lower area in the trailer, enabling the truck to go through the tunnel”, he says. Another member of the team, postdoctoral researcher Jesús Mosquera, emphasizes that “both the conceptual design of the work and its execution have been entirely developed at the CiQUS by the MetBioCat group, although the capsule was prepared during a short stay in Cambridge, as part of a collaboration with Professor J.R. Nitchske”. The list of authors includes researchers Jéssica Rodríguez, José R. Couceiro and Professor M. Eugenio Vázquez, all of them members of CiQUS.